Martha Berry is writing Mr. Eller (United States Game Warden) asking for advice in securing white deer for Mount Berry. She encloses literature for Mr. Eller and tells him there are 25,000 acres of land. She is very anxious to have white deer on the place. 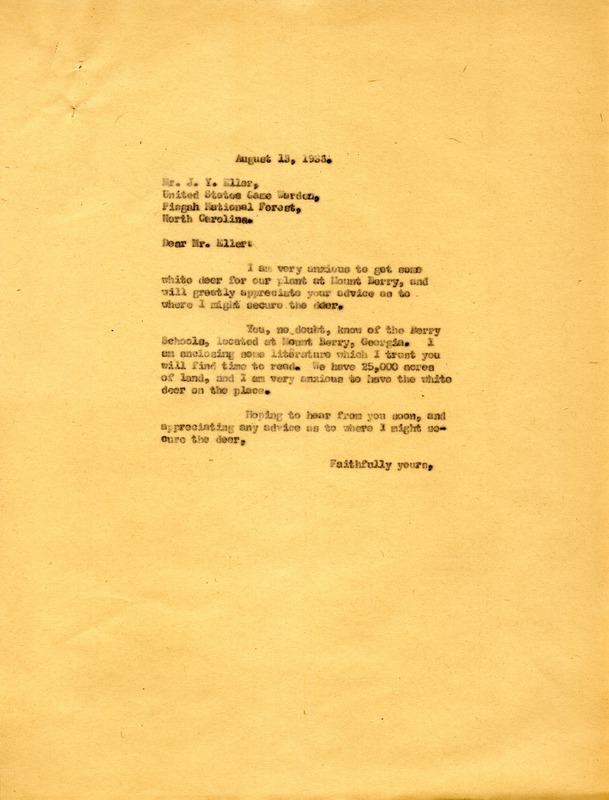 Martha Berry, “Letter to Mr. J. Y. Eller from Martha Berry.” Martha Berry Digital Archive. Eds. Schlitz, Stephanie A., Claudette Bearden, Chelsea Risley, et al. Mount Berry: Berry College, 2014. accessed April 20, 2019, https://mbda.berry.edu/items/show/13629.